Getting a low interest rate on your mortgage can make a big difference in your household finances, and the internet can be a good way to compare the rates offered by various lenders. The FTC’s case against GoLoansOnline.com shows the value of shopping around and checking multiple sources of information. Earth Day is April 22 – and thoughts may well turn to spring cleaning. Maybe you’re ready to brighten your home with a fresh coat of paint. Maybe your garden can use a little pruning. If you want supplies or paint that are better for the environment, chances are you’ll rely on advertising for information about the products you choose. The Federal Trade Commission requires truth in advertising, including green advertising. That means companies need solid evidence to back up the environmental claims they make about their products. Earlier this week, law enforcement, legal services attorneys, consumer advocates and nearly 120 other people found common ground in Las Vegas. The Federal Trade Commission put together “Protecting Nevada’s Consumers: A Common Ground Conference” to discuss the consumer protection issues facing Nevadans. What did we learn? That Nevadans face some unique challenges – but many more are the same kinds of challenges we see across the region and country. 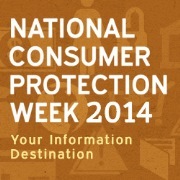 Sunday marks the 16th annual National Consumer Protection Week. The Federal Trade Commission stands with 74 federal, state and local agencies and organizations to stand up for consumers by highlighting the very best in consumer education resources. The Federal Trade Commission recently settled allegations that N.E.W. Plastics Corp. made deceptive environmental benefit claims for its plastic lumber products. According to the FTC, N.E.W. Plastics exaggerated how much recycled plastic it used in some products, and falsely claimed all its products could be recycled. Thanks to a request by the Federal Trade Commission, a federal court has ordered a light bulb company to ante up $21 million for refunds to consumers who bought their LED bulbs. At issue were misleading and exaggerated claims by a company called Lights of America Inc.
Shopping For a Home Appliance? Is it the right color? Right size? How does it stack up in terms of energy efficiency? Those are some top questions for anyone shopping for a home appliance. 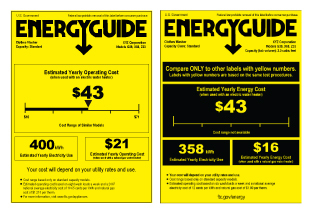 EnergyGuide labels, created by the Federal Trade Commission, are one key source of information. They show an appliance’s estimated annual energy use, energy cost and key features. A homeowner who’s worried about foreclosure or desperate to refinance might listen to a caller who promises to help. Unfortunately, not all cold-calling telemarketers do what they promise. Enter the Federal Trade Commission’s nearly $3.6 million settlement with Prime Legal Plans.